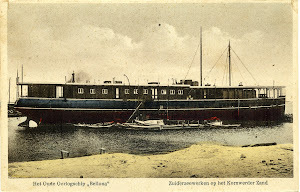 An item reported that the Dutch steam trawler Urania (IJM 65) of the bankrupt N.V. Stoomvisscherij Mij. Die Seelvisch was sold to L. Parlevliet Dzn. and and Fred. Ossendorp. She laid up for quite what time and was o be recommissioned as Spaarnestroom. Dimensions 32,72 x 6,45 x 11,66 meters and 180,09 gross register tons. The edition dated 2 December 1932 reported that the Spaarnestroom (IJM 64) was again sold. New owner became Gebr. Deker, Egmond aan Zee, Netherlands.